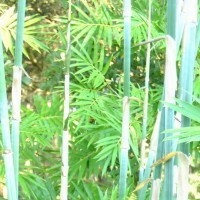 Thigpen Trail Bamboo Farm - Non-invasive & Grove-forming Bamboos for the Deep South & Beyond! Bamboo is also Drought-Tolerant, Hurricane-Resistant, Infinitely Useful, and Even Edible! Including Groundcover and Timber Bamboos! Welcome and thanks for visiting! We are a family-owned and operated farm and nursery, growing over 100 varieties of bamboo and other useful/edible/native plants. Our farm is located on the historic Thigpen Trail in southwest Georgia, USA. Nearby towns include Moultrie, Thomasville, Tifton, Valdosta, and Albany, Georgia. We are also a short drive from Tallahassee and other locales in northern Florida. 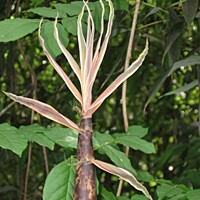 As South Georgia's first bamboo nursery, we are familiar with the best bamboo varieties for our area, their growth habits, and potential uses. For our customers further north, we also grow many cold-hardy bamboos, some of which are reported to be evergreen to -20 degrees fahrenheit! Whether you are a wholesale or retail customer, we look forward to working with you to pick the bamboo that best suits your needs! So that we may give you our undivided attention, we ask that all visits to the farm are by appointment only. Please look around our site and feel free to contact us with any bamboo questions! Since the farm is also our home, we are working to develop it in a way that makes sense on many different levels. With this in mind, our work here is somewhat broad and, like bamboo, must be flexible and adaptable to change. However, our mission is comprised of three objectives that we feel must be unwavering: to produce quality plants at fair prices while working to fulfill each customer's unique needs; to promote the many positive aspects of bamboo and other plants of interest; and to practice responsible land stewardship, improving the health of the land and ALL of its diverse life forms. Common landscaping applications for bamboo include: fast-growing privacy screens, windbreaks, noise/dust barriers, tropical specimens, groundcover, and erosion control. Available bamboos range from just a few inches to seventy or more feet tall and everywhere in between. And unlike other common screening plants, the strength, resilience, and rapid growth of bamboo make it nearly hurricane proof, a prime consideration for those of us who live in the Deep South. Beyond landscaping applications, bamboo has literally thousands of practical uses and has great potential as a rapidly renewable and eco-friendly raw material. Interested? Please visit our Why Bamboo? and Farming Bamboo pages for more and check out our bamboo links for a deeper look into this fascinating group of plants! In addition to bamboo, we also collect and grow other useful, edible, and native plants suitable to our bioregion. We are continually adding to our plant collections, so please check back often for new selections!